DragonPlate, the maker of light-weight carbon fiber composite components, was recently granted patent #9803672 for their Modular Carbon Fiber Tube Connector System. These tube connectors provide an easy and robust method for connecting carbon fiber tubes. 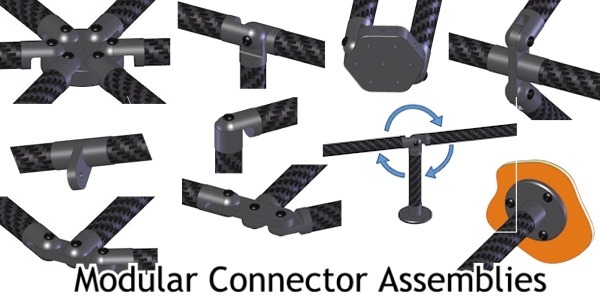 These connectors are sure to revolutionize the connection of carbon fiber tubes. DragonPlate has been granted a patent for their Modular Carbon Fiber Tube Connectors. Using these anodized aluminum connectors, 0.5", 0.75" or 1" carbon fiber tubes can be connected to form disassemblable complex structures. Both 2D and 3D joints are possible. No complex fixturing, screwing or drilling of tubes is necessary. The patented design creates a superior bond that does not require drilling of holes that can compromise tube strength. Connectors are available in many different configurations allowing for creation of hundreds of joints and an unlimited number of light-weight rigid structures can be built. “These connectors are sure to revolutionize the connection of carbon fiber tubes.”, commented Andy Morabito, marketing manager of DragonPlate. “Previously, there has not been a practical way of connecting carbon tubes in a way that doesn’t compromise the integrity of the tube and takes full advantage of carbon fiber tube strength.”, he added. DragonPlate is a trade name for “off-the-shelf” carbon fiber composite components manufactured by Allred and Associates Inc. They offer building materials such as carbon fiber sheets, tubes and structural components. They also provide engineering services and manufacturing of custom designed composite parts. They are located in central New York.